A few days ago I was fortunate enough to receive an advance review copy of On the Existence of Gods by Vox Day and Dominic Saltarelli. Full disclosure: I was given this e-book specifically for the purposes of reviewing it, and publisher and co-author Vox Day has also published one of my own previous works. On the flip side, I specifically requested a chance to review this one. Indeed, I jumped at the chance. As a philosophy major and a former atheist turned agnostic turned eventually Catholic, you might imagine that the topic has some interest for me. Saltarelli was an unknown to me, but I’ve followed Day’s blog for quite some time and I figured this work would at least be interesting. The book is actually a reprinting of a debate between Day and Saltarelli that I believe was originally published on Day’s blog, although I can’t immediately track down the original posts. Somehow I missed it in its original run. To begin with, Saltarelli is to be commended on several fronts. First, for agreeing to debate Vox Day. Regardless of your opinion on the controversial man, he’s a formidable debater. Second, having accepted the challenge, Saltarelli gave it an honest go. More than most of today’s atheists are willing or able to, he kept it to an honest intellectual argument. He refrained from “that’s just silly” dismissals, ad hominem attacks, attacking straw men, and other dishonest debate tactics. Mr. Day, for his part, held to the same high standard. The result makes the debate a strong one, and well worth the read. But Saltarelli’s biggest achievement is one he must share with his co-author. I’ve read quite a bit out there on this topic, and I’ve participated in many informal versions of this debate – on both sides of it. This is the first thing that I’ve read in a very long time that actually had new, novel, and interesting arguments – and both authors achieved this, on both sides of the debate. My singular complaint about the book is that the format of it virtually guarantees that the arguments on both sides will be underdeveloped. This does indeed turn out to be the case – in particular, Vox Day’s argument from the existence of evil is here represented almost criminally poorly, and I’d love to see it fleshed out in greater detail. I believe I can fill in many of the details, but I’d very much like to see his own logic here. In essence, he’s sold me on the argument but I feel that he needs to show his work. Still, I find myself giving this book five stars purely for the astonishing achievement of presenting novel arguments. After two thousand years of debating the topic, that’s a remarkable achievement. This book is unlikely to change any minds. But if you’re interested in the topic on an intellectual level, it’s worth the read. There’s a reason that martial arts are called “arts.” There are a lot of myths, half truths, gray areas, and outright lies in our field. And even when we can demonstrate with practical experience that something works, martial artists all too often have a terrible understanding of the science behind why it works. 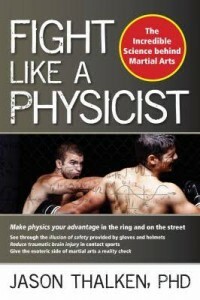 In that environment, Fight Like a Physicist by Jason Thalken is a real breath of fresh air. Thalken’s tome is basic rather than exhaustive. Anybody who’s had a college level physics course should be familiar with most of what he lays out. The problem is that all too many college educated martial artists leave their physics knowledge outside the dojo door, swallowing whole whatever their sensei feeds them. The even bigger problem is that too many senseis are feeding them a diet of junk science. And it’s a shame, because there’s very good, very real science to back up much of the martial arts. Thalken covers the key concepts here – center of mass, momentum, energy, rotational physics, and leverage. Again, none of this is groundbreaking to any college level physics student. But what Thalken does is to apply the physics to the body and explain how it interacts when human beings fight one another. In the second section, Thalken discusses some of the ramifications of the physics he lays out in the first section. Importantly, most of this section is given over to safety. His discussions of padding, gloves, helmets and concussions should be required reading for any martial arts instructor or coach. My only complaint about this book? As I mentioned above, it’s not an exhaustive tome. It’s more basic than I would have liked, covering a lot I already knew (I did take college level physics). I’d very much love to see a follow on to this book at a far more advanced level. Mr. Thalken, if you’re reading this, know that I’d buy such a book in a heartbeat if you wrote it. For what it is, though, this book is top notch. Five out of five stars, and I would consider this book a necessity for every serious martial artist. This post has been cross posted to the Madison Martial Arts blog. 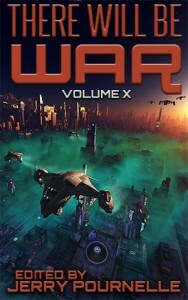 I finally had a chance to finish all of the stories by my co-authors in There Will Be War: Volume X. With apologies to my other co-authors, I didn’t actually receive my author’s copy until about 24 hours before it went live on Amazon. Then the holidays hit. And then John C. Wright sent me a manuscript, and I got a little sidetracked. I must say, though, I am blown away by this collection. I am absolutely honored to have my own piece set beside these other contenders. There is not a single weak piece in this collection. Seriously. I make a few nitpicks about some of them below. This should not be taken in any way to mean that I didn’t enjoy them. I did definitely enjoy some more than others – but I can almost guarantee that your experience will be different. Ever story in here is strong enough that somebody will consider it to be his favorite. Heck, two poor, deluded souls even thought my own story was the best in the collection, for which I’m very grateful but I ask you to please stop smoking crack. Below the fold are my own thoughts on the individual stories for any who would like to read them. There are no huge spoilers here, but neither is it fully spoiler free. Proceed at your own risk. 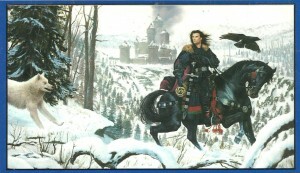 “Swan Knight’s Son” by John C. Wright is now available! I received a surprise Christmas gift this year, and it happened to be one of the best that I’ve ever been given. 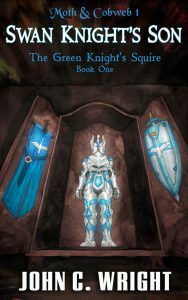 Mr. John C. Wright sent me the first twenty-two chapters of his current work in progress, “Green Knight’s Squire.” I forced myself to finish the book I was already reading first, knowing that I might not make it back to it if I allowed myself to be interrupted. And then, of course, Christmas itself hit with all of its obligatory time commitments. So it took a little bit before I was able to sit down and properly enjoy what I’d been sent. I have now finished reading the story as it was sent to me. And I must share that even in its current incomplete form, Mr. Wright has accomplished something truly special here. Now, if you’ve read this blog for any time then you know that I’m a huge fan of Mr. Wright’s work. But what Mr. Wright sent me this Christmas is far more than just a wonderful story – although it is that. It’s far more than a mere few hours of solid entertainment – although it’s definitely that. It carries more than beautiful prose, interesting characters, and memorable lines – although it has all of that in spades. The manuscript that Mr. Wright sent me this Christmas will be placed next to George Washington’s Rules on Civility, the Fear is the Mindkiller poem, and the “What every boy needs to know about being a man speech” as, well, the lessons I give my boys in what they need to know about manhood. More than that, this story made me face up to my own shortcomings as a man and double down on attempts to do better in the years to come. 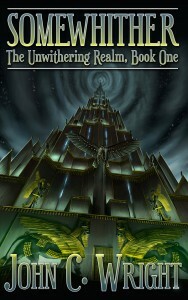 I am very excited to see the final version of this tale, and to see the rest of the series as it unfolds. And I’m very grateful to have been given this early sneak peak at it. Update (8/29/16): The final version, Swan Knight’s Son, is now available on Amazon! (1) what kind of event in history would produce the amount of mass-energy needed to divide the timeline, that is, to make a near-identical copy of an entire universe (or, if not the entire universe, the continuum as seen from within the lightcone of Earth) — where would the energy, equal (at least) to the Big Bang come from each time such an event occurred? (2) How can I have an excuse for a scene in which a totally buttkicking and semi-invulnerable seventeen year old squire of the secret interdimensional monster-slaying Roman Catholic ancient and honorable military order of the high-tech Templars with a magnetic accelerator machine pistol in one hand and his granfather’s blessed katana in the other, the finger bone of Saint Demetrius of Sermium in a hollow crucifix about his neck, faces off against the undead Pharaoh Busiris, a Lamassu armed with Gaebolg and a Nephilim armed with Gungnir (not to mention a blooddrinking lilim, an Abarimon swifter than thought, a golden goyim golem, and a Naga armed with a daevaastra, and Baba Yaga in her hawk-legged hut) fighting in wild and desperate melee atop the sloping upper hull of a burning ironclad Zeppelin toppling into ocean boiled by nine erupting volcanoes during a subsea earthquake and lightningstorm tornado caused by an puncture-wound in timespace eating the doomed world like a black hole? While under orbit-to-surface fire from kamikaze Babylonian spacewarships blazing like meteors overhead plunge gallantly to their fiery dooms in desperate attempt to slay the young hero? I don’t recall the exact scene described here from the book – although it’s very possible that he was, in fact, describing several scenes in the book mashed into one description. But the short version of my review is this: the book is exactly as awesome as that description makes it sound. In other words, if that description is right up your alley, you will love this book. If that description doesn’t do it for you… this is not the book for you. Fortunately I am right smack in the target audience of this book, to the point that when I read that post I showed it to my wife and said, “I’m buying this book the day it comes out.” I didn’t quite make that, because they stealth released it on me last week. But when I realized on Sunday afternoon that it was out, I literally turned off the show that I was watching, ordered it, and started reading. The opening chapter of this book was amazing, and can be read for free on Mr. Wright’s blog. If you enjoy that… well, you’re going to get a lot more of it. This book is a giant blast of crazy, and in the best possible way. I recommend it highly. 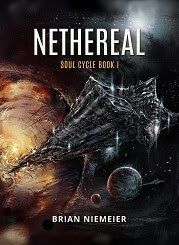 I recently finished Nethereal, the debut novel from Brian Niemeier. I’m not a fan of the recent trend in genre fiction towards bland, generic covers that try to hide the fact that the books are genre. I bought Game of Thrones back nearly twenty years ago when it was still printed with the original paperback cover shown below. I’m not afraid to admit that I bought that book for the cover, too. In both cases, it was a good choice. Nethereal is a strong debut novel. The characters are interesting. The setting is interesting. The plot bogs down just a bit in the middle, but otherwise moves at a brisk pace. Most importantly, you’ll want to know what happens next to these characters. The most frustrating thing for me in reading this book was that I was so busy that I had to read it in short segments. I kept getting angry that I had to put it down to do other things. One other aspect of the book that I found very interesting was the way his world paralleled the nine circles of hell in Dante’s Inferno. I have a strong suspicion that the rest of the series will continue the parallels with The Divine Comedy, and I’m quite curious to watch it unfold. Five stars for this debut effort. I’ll be watching Brian’s career with interest. 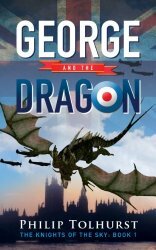 Last night I finished George and the Dragon by Philip Tolhurst, a book that asks an incredibly important question: what would happen if the Luftwaffe started using dragons in the midst of World War II? Now, this is the kind of thing I would have loved anyway. But I’d recently done a blog post on how a fight between an Apache helicopter and a dragon would turn out in the real world. Naturally, the idea of dragons vs WWII era aircraft caught my interest as well. I’ve already added my own take on the subject. But, of course, half the fun is reading somebody else’s take on it so that you can have stupidly heated discussions afterward! Alas, on that front Mr. Tolhurst and I are generally on the same page. Although we might quibble some over the details, we’re in the same general ballpark on our analysis of the capabilities of Spitfires vs dragons. So with that out of the way… on to the book itself! First of all, I did not realize up front that this is a children’s book. That’s not a negative quality of the book, mind you. However, it’s written like a children’s book. If you’re expecting something different going in to the story that very well might effect your enjoyment of it. At some point about a third of the way through I remember thinking, “Man, he really needs to market this as a kid’s book.” And then I went and looked online and found out that he was marketing it as a kid’s book. I was just the idiot who hadn’t gotten the message. With that out of the way, I settled in to enjoy the story for what it was and not what my expectations of it were. And in that mindset, it’s a quite enjoyable story. When he’s just a little bit older and able to read a book at this level, my oldest son will go bananas for this (and that word was chosen on purpose, because he’d eat bananas until he explodes if I let him). However, the book does have some flaws. The plot is a bit generic. On the other hand, it is a kids book. So that’s not really a flaw in the book so much as its reader. More frustrating is that the book really needs a pass from a good editor. Bits of the story read as if it suddenly occurred to the author that he’d left out some important information and he really needed to put it in right now. Another draft to clean some of that up would have really helped. On the other hand, most kids won’t be bothered by that. But the biggest problem for me was grammatical. Now, I try really hard not to be a grammar Nazi. I like to think of myself more as a “grammar libertarian.” But that’s only good up to a point. The author continually exhibits one problem in particular: he has a tendency to jam two to three sentences together with no punctuation, capitalization, or phrase marking to separate them. This is an irritation, though, and it doesn’t serve to make the story difficult to read. In fact, with proper punctuation and capitalization there wouldn’t even be a problem – each thought is, in fact, a completely separate sentence and grammatically correct. They’re just not separate correctly. The good news is, most children will have no trouble reading that. In fact, it might even fit well with how most children think. For me, however, it was a serious detraction from the story. As this book appears to be self published, my advice to Mr. Tolhurst for the sequel would be to find an editor and pay out of pocket for the service. A good editor could have taken this book from a B- to at least a solid B+, and maybe an A. The core is there, and Mr. Tolhurst is to be commended for it. Although the flaws are minor, I do have to drop it just a bit to four out of five stars. Strongly recommended for children who love dragons or airplanes. Good for a fun, relaxing read for adults who love the same. The second title from Larry Correia’s book bomb that I’ll be reviewing today is “Transhuman and Subhuman: Essays on Science Fiction and Awful Truth” by Mr. John C. Wright. Yes, I just reviewed another of Mr. Wright’s works. And yes, Mr. Correia just book bombed that one as well. They’re both worthy of it. But first, a story: A friend of mine joined the Roman Catholic Church last Easter. My wife and I are also converts to the church, and even though we weren’t able to sponsor him or follow him through RCIA due to other commitments on the nights that it meets, we were happy to see him join and wanted to welcome him. So we bought him a book. No, it wasn’t this one. 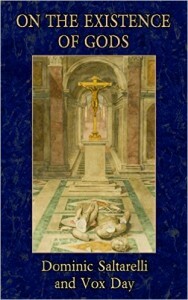 We bought him G. K. Chesterton’s Christian Writings – a solid choice for anyone interested in Catholic thought. Me: Yeah, I really feel like John C. Wright is Chesterton come again for our modern age. My friend: It’s funny you say that, because I was just about to say that Chesterton reminded me of John C. Wright. Nowhere is that more apparent than in this work, a collection of philosophical ruminations on modern culture. From his thorough and complete explanation of why the recent Hobbit movies are so completely terrible to an Aristotelian explanation of why Snow White has animal helpers to ruminations on the value of science fiction itself… these essays are truly amazing in every way. He even managed to explain why I didn’t really like The Golden Compass, which was a book that never satisfied but I couldn’t quite put my finger on why – until now. I have exactly one complaint about this collection, and Mr. Wright will probably hate me for saying this as it might impact his sales: almost all of these essays are also available for FREE (albeit in less polished form) on his blog. If you feel like wading through all the other stuff (and you should actually go read all of that, too), you can save yourself a whopping $4.99. Or you could just pay a little bit, give the man what he’s due for such amazing writing, and get the nicely collected, well-edited version. Yeah, do that one. The indefatigable Larry Correia is running another book bomb today. Again, as it happens, I’ve already purchased and read two of the works on the slate. So today I will contribute by reviewing those two works. First on today’s list is “The Hot Equations: Thermodynamics and Military SF” by Ken Burnside. This essay is part of a wider collection of military science fiction stories and essays about military science fiction entitled Riding the Red Horse. There’s no other way around it: this essay is essential reading for aspiring writers of space based “hard” science fiction. The main gist of the essay is this: the laws of thermodynamics impose limitations on space travel. Space opera and science fantasy mostly just ignore these problems, but even most “hard” science fiction barely acknowledges them, much less actually account for them. If you’re going to write “hard” science fiction, you need to deal with these issues. The essay covers the relevant material in a thorough but concise manner. Importantly for most laymen – especially of the aspiring writer variety – he also touches on the concepts with minimal amounts of math. You will understand this essay. And if you’re planning to write about space travel, you should read and understand this essay. Non-writers who are simply interested in the topic will also find this essay to be of interest… unless you’re an actual rocket scientist, in which case you’ll probably find it boring. This essay was actually the direct inspiration for my story “The Fourth Fleet” which appears in the anthology Make Death Proud to Take Us. I leave it to the readers to decide if the story honors the science of “The Hot Equations” – or if it’s any good. Last week I took some friendly advice and dove into the novel Reamde by Neal Stephenson. I will admit to being a little nervous. My experience with Stephenson’s novels has been a bit hit and miss. My brother gave me Snow Crash for my birthday one year. I don’t remember which year, but it was a good while ago. Definitely before I was married, possibly before I even met my wife. He pushed me to read the opening segment with The Deliverator on the spot… and he was right, it really was one of the better sci-fi sequences I’ve ever read. And the novel had quite a bit more of that flavor of insane fun to add. On top of that, it had some really interesting ideas. Believe it or not, some of those ideas played a serious role in my conversion not just to Christianity but to the Roman Catholic Church. But it was also kind of a mess of a book. I used the term insane fun for a reason. The book was kind of insane. Stephenson has a knack for penning some of the craziest, wildest, most amazing sentences you’ll ever read. And he can, at times, chain these together into some of the most sequences you’ll ever read. But putting them all together into a coherent story… in some of his works, that hasn’t always happened well. Snow Crash all came together, but the book bogged down a bit about three fourths of the way in and the resolution all felt a little weak to me. And yet despite these complaints, it was an absolutely amazing book. Truly, the good parts were so good that they really made up for some fairly serious deficiencies. However… I didn’t have such good luck when I tried to read more of his stuff. The Diamond Age lost me altogether about a third of the way through and I never finished it – or really wanted to. I made it through the first book of The Baroque Cycle. I found the concept interesting, really enjoyed his depiction of Benjamin Franklin… and totally and completely couldn’t get into the second book. So when I saw such high praise for Reamde, I was a bit cautious. I had high respect for the source of the recommendation… but Stephenson had burned me before, and burned me hard. But then, also – Snow Crash. So I downloaded the free trial on my Kindle and gave it a shot. And then when I finished that part, I paid for the full book. And then I didn’t come up for air for about four days (it’s a long book – 1056 pages in paperback – and I had quite a bit of work to do in between reading sessions). Not once at any point did I want to put it down. I was thoroughly and completely engrossed from the moment I picked it up until the very end. The characters were interesting, the background setup was interesting, the plot was interesting. Unlike some of Stephenson’s other works, it was entirely readable all the way through. And it was one big giant bundle of insanity. It’s not quite as audacious as Snow Crash. But really, what is? To this day, Snow Crash is one of the most audacious pieces of science fiction I’ve ever encountered. But it carried the same bombastic spirit of over-the-top craziness that fueled Snow Crash, kept everything firmly rooted in the real world (as opposed to Snow Crash‘s somewhat… fantastical plot driver), and just never let up. Before I was about a third of the way through, the book had completely changed on me about three times. I thought I’d figured out what I was in for and then boom – here’s this other whole new element. I enjoyed that I couldn’t quite figure out where he was headed. Not plot wise – the basic gist of the resolution is obvious from pretty early on – but how he was going to get there. In case you haven’t figured it out, I loved this book and highly recommend it. I do have two complaints, though, and I think they’re worth noting even though they were far, far from ruining the experience. First, one of the major characters – Richard – has an inexplicable character moment about three quarters of the way through the book. After he’s spent most of the story manipulating people based on their emotions and pushing them to do what he wants, we’re suddenly informed by the author that he hates manipulating people and is a “doer” kind of person. Well, yeah, he’s been a “doer” all book. But he’s also been cheerfully manipulating people as if he were born to it. I chalk this up to an editing issue – the book is so big that there were probably some changes made during its construction and Stephenson likely just missed this. But it was a little jarring. Second, the resolution… he should have spent just a bit more time in the aftermath. It felt a bit like running a marathon and then just stopping without a cool down walk. Doable, and it doesn’t exactly detract from the marathon itself, but you feel a bit rough afterward. But these are pretty minor complaints in a book that is otherwise so fantastic. This is one of the best things I’ve read in many years.